Considering that food is the last thing you need to worry about in a survival situation, most people who become lost or disoriented in the woods will either find their way out of the ordeal, or be found by searchers before they succumb to starvation. The order of survival is shelter, water, fire, and food. And we know that we can live for at least three weeks without food. But we also know how depleted we become even after skipping one of our three daily meals. So food is essential for providing the energy to ensure the other elements of a survival situation can be secured, and also to help us make rational decisions. The bottom line is that our minds are our best tool. Once the mind starts to slip, we’re in trouble. Here are some wild edibles you can source in California’s Sierra Nevada mountains. The scenario I am providing takes place in the Sierra Nevada mountains in California. From the Rockies to the Cascades, there are many common trees and plants. I have included a few of the most common in order to provide an idea of which wild edibles are the easiest to identify. After 50 years in these mountains, I still occasionally stumble across plants for which I am unfamiliar, but there are a few that are always obtainable, no matter which of the above mountain ranges I find myself. 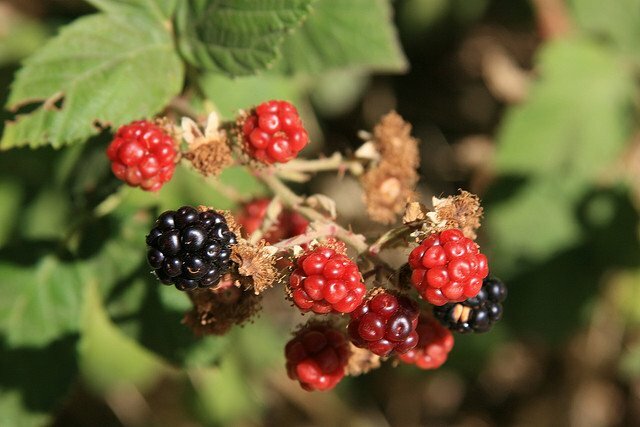 Nothing tastes as good in the wild as wild berries. Unfortunately, if you don’t have experience with them, I can’t honestly recommend eating any except for blackberries, which are very easy to identify. If you find berries and you must eat them, I advise one thing beforehand. Take the berry, crush it and rub a little on your lips. If after about 20 minutes or so you feel numbness, tingling or get a rash, throw it away. This is the best way to test any berry in the wild. Avoid any white berry and most blue or black berries (aside from actual blackberries). Wild raspberries are also a safe bet because they look exactly like raspberries. Rose hips are abundant and are characterized by their thorny stems (which look a lot like regular rose stems) and provide an excellent source of vitamin C and anti-oxidants.I could write a book on berries alone but I would advise staying away if you’re not absolutely certain about the berry in question. Dandelions—Dandelions are found everywhere and the whole plant is edible. Clover—Clover is unmistakable and is also quite abundant in the wild. All parts are edible. Miners lettuce—Miners lettuce is delicious and very easy to identify by its round leaf and single stem growing through the middle. There are tiny five petal pink or white flowers at the end of the stem. Once you see it, you will always be able to identify it and it is a great source of Omega 3’s. Cattails—Cattails are found in nearly every pond and beside many sources of water. They have been described as the perfect wild food and one could literally survive on them alone. If you are lucky enough to find them where you’re lost, you’re in great shape. The lower stalks can be eaten raw and are an excellent starch. You can eat the spikes, pollen and flowers. They are also great for making mats and baskets. Pine and fir tips and needles—You can eat the fresh tips of pine and fir trees and you can make a nutritious tea out of the needles. Pine nuts—The nuts of all pines are edible and can be found almost anywhere in the Sierras. Bark—The cambium (inner layer) on willow, birch, pine, basswood, spruce, fir and tamarack all can be eaten. Grass—Most, if not all grass can be eaten. The best way to get nutrients is to chew it for awhile and spit it out. I would highly recommend getting a hold of a couple of field guides on wild edibles. Two of my favorites are Edible and Medicinal Plants of the West by Gregory L. Tilford and The Foragers Harvest by Samuel Thayer.